Alzheimer’s disease (AD) is the most common and fastest growing cause of dementia, accounting for an estimated 60 to 80 percent of all cases. Irreversible and progressive, AD slowly destroys memory and thinking skills and, eventually, the ability to carry out the simplest tasks of daily living. Although treatment can help manage the symptoms of AD, there is no cure for the disease. Detection of Alzheimer's Disease using PET. 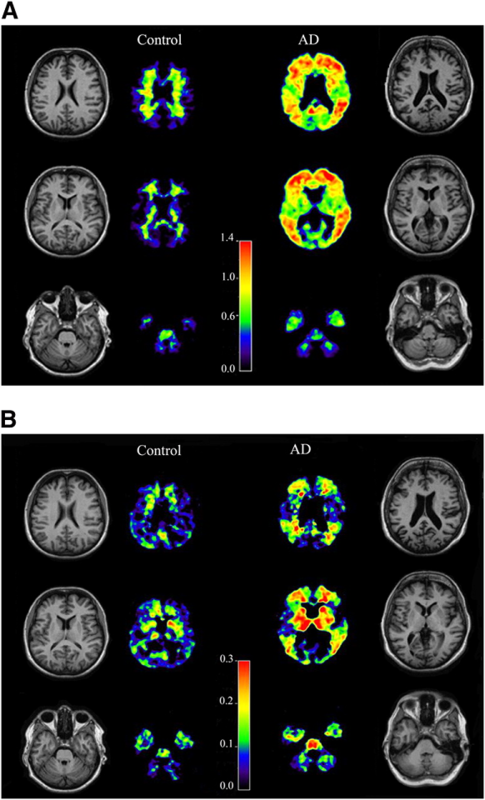 (A) 11C-FIB PET scans and (B) 18F-FDDNP PET scans between a healthy patient and one with AD. Patient average age is 67 years old. According to the Alzheimer’s Association, an estimated 5.3 million Americans are currently living with AD. By 2025, that number is expected to increase to more than 7 million. Several brain changes are believed to contribute to the development of AD. The hallmark changes of AD are the accumulation of the protein beta-amyloid outside neurons (called beta-amyloid plaques) and the accumulation of an abnormal form of the protein tau inside neurons (called tau tangles). Plaques and tangles may make healthy neurons in the brain work less efficiently and eventually die. Neurons in the hippocampus — the brain’s learning and memory center — are among the first to be damaged and die. Neuronal damage eventually spreads to other parts of the brain, causing it to shrink with the loss of neurons. Scientists believe the brain changes of AD begin 20 years or more before the clinical symptoms appear. The three stages are characterized by specific biological states, such as decreased glucose metabolism, accumulation of beta-amyloid plaques, and brain atrophy (shrinkage). These “biomarkers” can be detected and monitored by blood and cerebrospinal fluid testing and by positron emission tomography (PET) and magnetic resonance imaging (MRI). For more information on the new diagnostic criteria, visit the Alzheimer’s Association website. The ability to image the build-up of beta-amyloid plaque in a living brain with PET scanning has been a major breakthrough in dementia research. PET studies with a tracer called carbon-11-labeled Pittsburgh Compound B (C-11 PIB) have shown that adults with AD take up more PIB in the brain than do cognitively healthy older people. Other PET tracers similar to PIB have been approved in the United States (AmyvidTM, VizamylTM and NeuraceqTM). These tracers have a longer half-life than PIB, which would facilitate PET scanning in more locations throughout the country. In addition to developing new tracers, researchers are beginning to use PET to measure brain levels of the tau protein that make up tau tangles. PET scans also can measure the brain’s rate of glucose metabolism using the tracer 18F-fluorodeoxyglucose (FDG). In AD, characteristic brain regions — specifically, areas in the temporal and parietal lobes — show decreased glucose metabolism. Researchers hope that following brain changes over time in normal elderly people, people with AD, and people with MCI will establish biomarkers of the disease. PET will play an important role in this effort, imaging the brain as the disease progresses. PET is also emerging as a tool for identifying Alzheimer’s pathology in the preclinical stage. A major research program called the Alzheimer’s Disease Neuroimaging Initiative (ADNI) has followed hundreds of cognitively healthy individuals and others with MCI and early AD over several years. ADNI participants undergo annual MRI and PET scans to enable researchers to assess changes in the normal aging brain and in individuals with MCI and AD. By correlating participants’ images and other test results, such as cognitive evaluations and fluid and urine samples, researchers hope to identify valuable biomarkers of the disease process. The first ADNI effort was launched in the United States in 2004. Today, however, numerous ADNI programs are operating around the world (World Wide ADNI), storing data that is freely available to researchers.